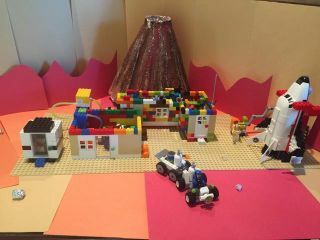 One of the winning entries in a contest hosted by Lego and NASA, which asked contestants to build a Lego scene showing what space exploration might look like in the future. This photo shows one portion of a home on Mars, built by user Adventures1213. Four winners have been announced in a space-themed Lego building challenge, created in collaboration with NASA. The "Mission to Space: Build Your Future" challenge asked participants to use Legos to create a scene that imagined how humans might explore other planets or space destinations one day. Four winning entrants were selected by judges from Lego and NASA, according to a video message on the Lego website. The winning designs included a moon house, a home on Mars, a spaceship and a "laboratory expedition module." Pictures of the winning builds are on the Lego website, in a gallery that includes the other contest entries. "The Lego group's job in selecting a winner of the challenge was to look at the most creative builds," NASA astronaut Nicole Mann said in a video message on the Lego website. "The NASA team's job was to find a couple of really cool and awesome space ideas … Your ideas are important and I hope you keep dreaming, designing and building." This isn't the first time NASA and Lego have teamed up for a space-themed building contest, and Lego regularly hosts build challenges on their website. Besides the winning entries, the photo gallery of contest entries includes some impressive Lego replications of real spacecraft, including the Juno spacecraft (currently at Jupiter), the New Horizons probe (that flew past Pluto last year), the SpaceX Dragon space capsule, the Soyuz rocket and spacecraft, and many more. If you missed the deadline for the contest, consider checking out the competition website, anyway. It features a slew of short "space facts," quizzes and fun videos about space that will engage young space fans.